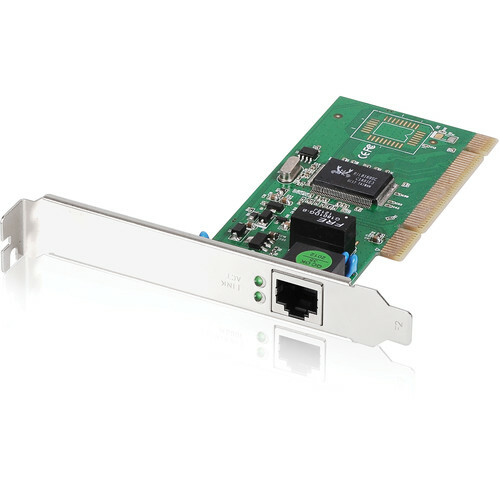 The Gigabit Ethernet PCI Network Adapter from EDIMAX Technology delivers optimal performance and wired network connectivity to desktop PCs. Gigabit home or business networks can be connected to the Gigabit PCI adapter and files can be transferred at speeds 10x faster than 10/100 Fast Ethernet. Once connected, accessing shared music, documents, movies, and photos will be easy and quick. It offers ease of installation and flexibility of configuration through plug-and-play technology. The adapter is fully compatible with Ethernet, Fast Ethernet, and Gigabit Ethernet networks. The 10/100/1000 Mb/s auto negotiation port eliminates any need for manual switching. Also it is supported by all major operating systems including Vista and Linux OS. To facilitate network connectivity, the adapter includes a user-friendly setup CD wizard. Its user interface simplifies driver installation for immediate use of the device.